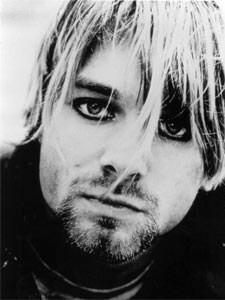 As with Kurt Cobain, we often mark the anniversary of death more than we do the birthday's of our icons. I suppose it's mostly true of those lives that ended in an untimely manner. Each generation can tell you where they were when they heard the news of the death of their own music icon, whether Buddy Holly, Jimi Hendrix, Jim Morrison, Janis Joplin, Elvis Presley, John Lennon or that of "Generation X's" Kurt Cobain. 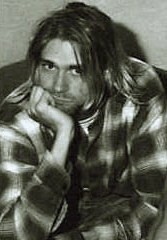 I'm sure only Kurt's mother can truly recall the day of his birth, but an entire generation born of grunge and flannel can tell you where they were when news of Cobain's suicide broke. I, personally, was in my office in Seattle where I was Program Director of Alternative radio station KNDD, "The End". Air Personality Jim Keller received the first call in the studio while on-the-air. More calls continued to stream in from listeners, fans, press and television, as we ourselves were making our own calls to our own connections seeking verification. Emotions of that instant and the hours that followed were nearly impossible to grasp. There were many, many excellent and successful musicians breaking out of the "Seattle Scene" at this moment in time, but somehow Kurt Cobain epitomized it like none other. His death brought collective chills down a generation's back. At the radio station, we halted our regular programming. We had no choice. No story was bigger. No music, other than Nirvana, was more important at this moment in our listener's lives. We aired the grief and memories from our listeners and enlisted a psychologist as well, to prevent any possible copycat reaction. Behind the scenes, it became impossible to allow ourselves to grieve. I, along with Music Director Marco Collins and Promotion Director Keri Lee, were hunkered inside our General Manager, Anna Shreeve's office. Nirvana's fans were already asking where a memorial was going to be. We were already searching for a place by calling several venues. We realized we needed a quick plan to allow a city to collectively gather and grieve the loss together. Upon hearing of our solo efforts in our search, two other Seattle rock stations, KISW and KXRX, rightly suggested we all join forces. A day later we were all sitting down with community leaders and the city government gaining permission to use the Seattle Center grounds, in the shadow of the Space Needle, for a massive memorial. It was quickly approved, as everyone was keenly aware of the need for an organized effort. At this memorial, other Seattle artists, friends and various radio personalities took the stage with their own memories of our generation's icon. As each speaker paid their tribute, thousands of fans, with candles burning, mourned. It wasn't until this moment, standing next to my competitor, Program Director Steve Young of KISW, that the two of us were also able to let our own tears fall and grasp the end of an era. As the years turn into decades, we can now, maybe, more easily commemorate his life, rather than just his death. 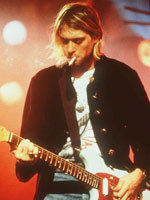 On Wednesday, February 20th, Kurt Cobain would've turned 41 years old. To celebrate his life, we are given a new opportunity to get to know Kurt, in his own words, in his own voice. Shout! 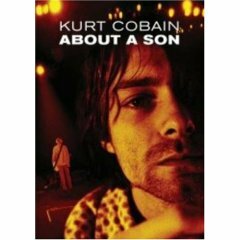 Factory has just released an intimate DVD where Kurt's own voice is allowed to tell his own story..."Kurt Cobain: About A Son". It's a portrait of his childhood, fatherhood, musicianship and reluctant icon. 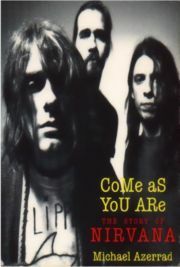 The narrative comes from more than 25 hours of audio taped conversations recorded during sessions with journalist Michael Azerrad, for his book "Come As You Are: The Story of Nirvana". 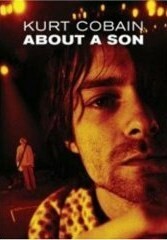 Recorded between December 1992 and March 1993, we are given a first-hand account of Kurt's life. He shares his personal thoughts, successes, failures, humor and sadness. This film debuted at the Toronto International Film festival in 2006 and has since screened at many others around the world. Director A.J. Schnack merged the interview material with images from all around Kurt's stomping grounds in the Pacific Northwest, including hometown Aberdeen as well as Olympia and Seattle. These images and Kurt's words are combined with an original score by Ben Gibbard, frontman of "Death Cab For Cutie", as well as the music of 20 other artists that somehow touched or influenced Kurt's life. A life that he himself cut well short of the 41 years that we now celebrate without him. 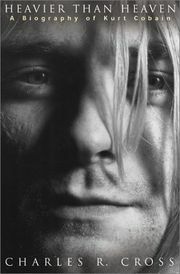 There's long been talk of a film adaptation based on Charles Cross' biography of Kurt Cobain called "Heavier Than Heaven". Last year, the talk started to become reality. Courtney Love acquired the film rights to that biography. Courtney already owns the rights to Nirvana's music and packaged those rights in a deal to film and release it with Universal Pictures. Pre-production is now apparently underway. David Benioff (adapted "The 25th Hour" for Spike Lee and worked on "Troy", "Stay" and "The Kite Runner") was named to write the screenplay for the film. Courtney Love and her attorney, Howard Weitzman, have named themselves co-Executive Producers of the project. Over the past year or so, several names have been floating around that may star in this "bio-pic". Ewan MacGregor and James McAvoy were first mentioned to play Cobain. The latest name mentioned as front-runner is Ryan Gosling. To play Courtney, Kirsten Dunst was mentioned early on, but word now has it that Courtney favors Scarlette Johansson to play her. Since Courtney is the exec, it most certainly will be her call to make. The only question is...who will accept the roles. Out in the Blogosphere, reaction is mixed...certainly a lot of interest, but with it comes apprehension as to how truthful the film will be with Courtney Love and her attorney ultimately in charge of the project. One blogger I've seen states, "How real will this really be with Courtney in charge...there's a lot of bad stuff that came down in their lives...how will it be portrayed?" Good question. Courtney does like control. One of my own personal encounters with her happened in September 1994. Hole was playing a benefit concert for us called "End It!". After the show, Courtney summoned myself and Music Director, Marco Collins, to her dressing room. Upon entering, she wondered, loudly, how we could possibly insult her and play artist Mary Lou Lord on our station. Marco took a walk to the other side of the room with her, as I let him take the brunt of her need to control. During this time, Frances Bean Cobain, all of 2 years old, came up to me and graciously offered me a bite of her slice of pizza. I got the better end of that encounter.